Planning and installing a central vacuum system is quick and easy. To work out where to best position the wall inlets consider that, as a rule, the suction hose is 7.5 to 9 metres long. If the wall inlet is positioned centrally in the building a single outlet per story should be sufficient. In large areas pipelines can be kept short by using multiple wall outlets and placing them as centrally as possible. The Disan team, retailers and fitters would be happy to help and advise you. Although retro-fitting in an existing building tends to be more complex, it is in fact, under normal circumstances, not that complicated. In most cases only a single wall inlet per floor is needed and, therefore, also only a single riser. This can run through furniture or can be surface-mounted and then covered. 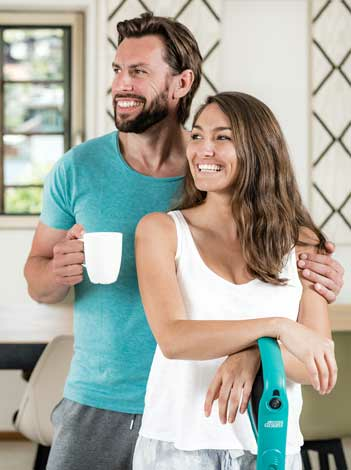 We have carried out such retro-fittings with Disan systems in houses and apartments that were not new-builds, in which people with allergies lived. In such cases every effort is made to ensure all allergens, dirt and dust are completely expelled from the living space. If building contractors are forced to keep costs down and, therefore, cannot include a full central vacuum system, it is still worth putting in a PVC pipe-system when building or renovating. The cost of a pipe-system not very high and can quickly and easily be installed. Moreover, it will add value to the property. 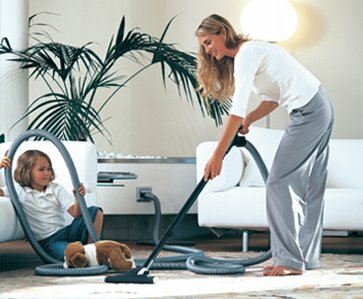 Customers will be grateful that they can then install a complete vacuum system at a later point without any problems. Structures erected according to passive building requirements do not have the sole advantage of huge energy savings. The focus is on healthy and comfortable living, which is created through structural interventions. Alongside room temperature, the air quality of the room plays a huge role. This is determined on the basis of the amount of CO2, the level of humidity (which should ideally be between 40% and 50% and never above 80% or below 30%) and how many volatile particles are in the air. The latter refers mainly to household dust.